If you are ever faced with needing an air ambulance, you’ll want to choose only the best air ambulance company available. You want a company that’s professional, caring, safe and passionate about providing you or your patient the best care possible. The differences that set air medical transport companies apart can be staggering. First Jet Rescue Air Ambulance uses jets. Not just any kind of vintage jets either. 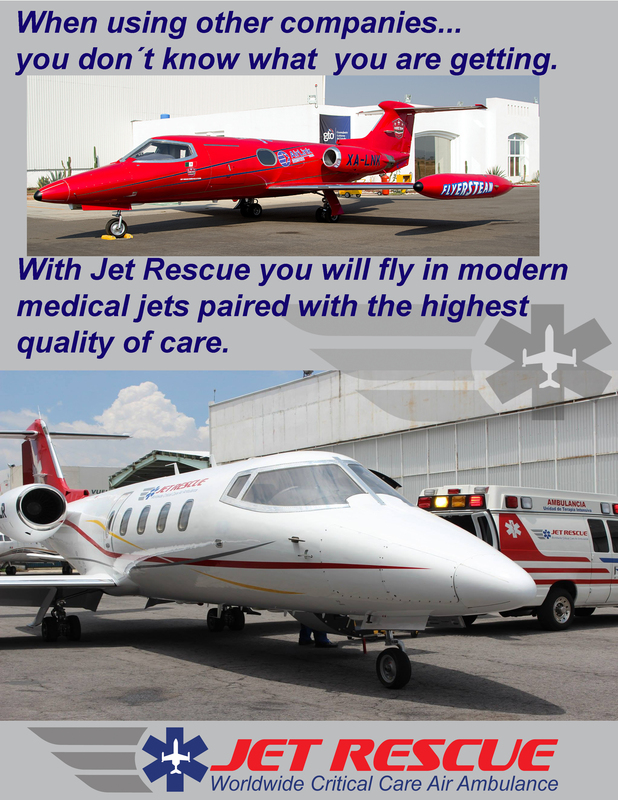 Jet Rescue Air Ambulance is committed to patient comfort, safety and outstanding medical care. That’s why we transport our patients in Learjets 35’s and Learjets 55’s that are configured with the best medical equipment available. Our fleet of Learjets are owned, operated and maintained by Jet Rescue. This is a key difference between Jet Rescue and the competition. Other air ambulance companies charter aircraft, any aircraft from any charter company. Other air ambulance companies are merely brokers trying to get the cheapest aircraft to maximize profit. This is important, because this so called air ambulances have no access to the history, maintenance and safety record of a chartered or brokered aircraft. By having our own aircraft, we maintain them mechanically and know them inside and out. Jet Rescue is proud to have a perfect safety record as a result of this. Why modern Long –Range Medical Jets Are Better Than Prop Planes or vintage Jets? Speed is key when you are transporting an ill or injured patient. There’s really no comparison between the speed of our Learjets and other companies prop planes. Prop planes fly slower and lower. The result is a bumpy flight for the patient. What about other vintage jets utilized in the industry? Older Jets have smaller cabins making it imposible to treat a critical patient in case the patient deteriorates in flight . 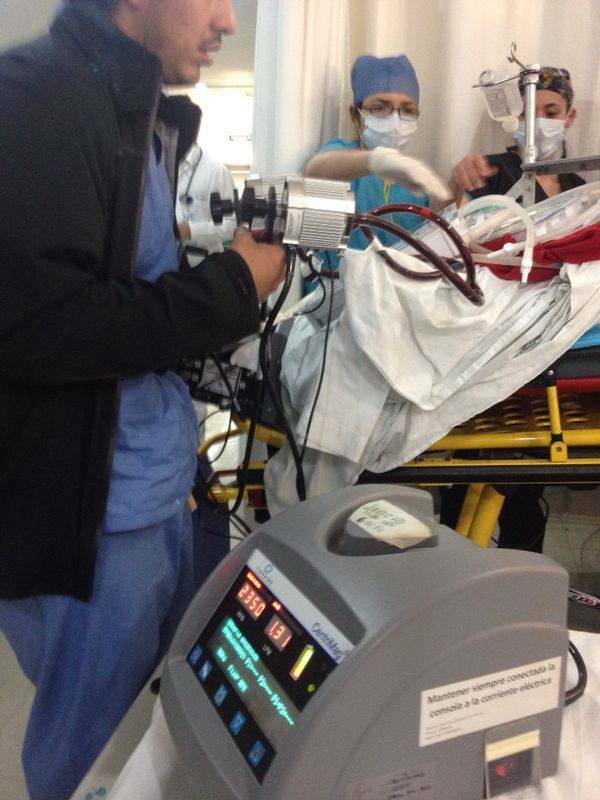 Critical interventions like CPR or intubation cannot be performed and are needed to save the patient´s life.Also Older jets utilize more fuel having a shorter range. Typical range for this aircraft is 1000 miles. Our Long-range Learjet 35 and 55 can fly at 45,000 feet and speeds of 451 knots. With a range of around 2,000 miles we can fly anywhere, anytime to international or domestic destinations. Jet Rescue Air Ambulance is committed to what we do. You won’t find this type passion and commitment anywhere else. We want the entire medical transport to be as easy and comfortable as possible. In addition to flying you in modern Medical Learjets, we communicate with your insurance company, we arrange your ground transportation, luggage transfer and more. Every aspect is covered and thoughtfully planned out on your behalf. 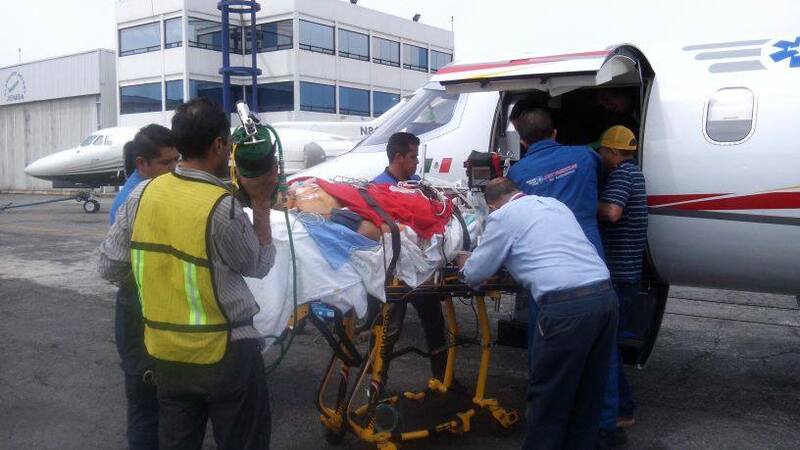 We assure that our medical flight crew is at your side every step of the way. This is our commitment to you so that you can focus all of your attention on your patient or loved one and not be worried about the details of the air medical flight.